HEINOLA, Fin. – Cole Caufield (Stevens Point, Wis.) recorded four goals and Jack Hughes (Orlando, Fla.) tallied six points as the U.S. Under-18 Men's National Team shut out Switzerland, 8-0, in its second exhibition game leading up to the 2019 IIHF Under-18 Men’s World Championship. John Beecher (Elmira, N.Y.) put Team USA on the board when he capitalized off an Alex Vlasic (Wilmette, Ill.) pass with 8:43 left in the opening frame. 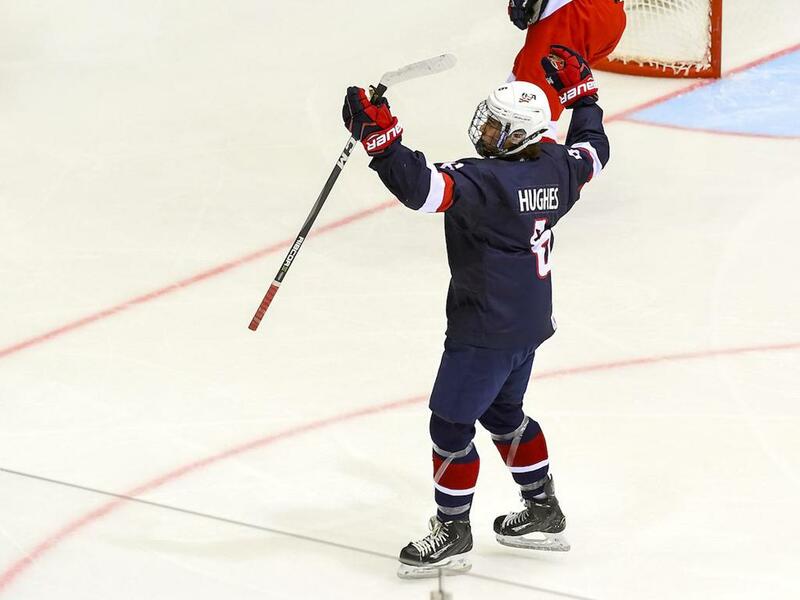 With 3:48 remaining in the first period, Hughes scored off his own rebound, before he assisted a Caufield one-timer 11 seconds later, putting the U.S. up 3-0 after 20 minutes. Beecher tallied his second of the game 1:40 into the middle stanza when he carried the puck toward the net, deked and backhanded the puck over Florian Vuichard’s left pad. Caufield registered his second of the game on the power play at 5:13 with assists credited to Hughes and Cam York (Anaheim Hills, Calif.). Hughes made it 6-0 when he split the Swiss defenders and fired one past Vuichard with 7 minutes remaining in the middle period. Caufield completed his hat trick and concluded the second-period scoring with a power-play goal at the 15:16 mark. With 8:01 left on the clock in the final period, Hughes passed to Caufield who buried his fourth of the game, accounting for the 8-0 final. Team USA goaltender Cameron Rowe (Wilmette, Ill.) stopped all 19 shots faced in the victory. The U.S. opens preliminary Thursday (April 18) at 7:30 p.m./1:30 p.m. (local/ET). All tournament games will be streamed live on NHL Network. NOTES: Team USA outshot Switzerland 32-19, went 3-for-3 on the power play and 3-for-3 on the penalty kill … Jack Hughes was named U.S. Player of the Game ... Team USA news, interviews, highlights and more can be found at TeamUSA.USAHockey.com ... For the official IIHF home for the U18 Men's World Championship, visit iihf.com/en/events/2019/wm18 ... All 21 players on the U.S. roster come from USA Hockey's National Team Development Program … Four players who won a silver medal for Team USA at the 2018 IIHF Under-18 Men’s World Championship are represented on the roster including Cole Caufield (Stevens Points, Wis.), Jack Hughes (Orlando, Fla.), Spencer Knight (Darien, Conn.) and Cam York (Anaheim Hills, Calif.) … Twelve different states are represented on the roster. Massachusetts and New York lead the way with five skaters, Illinois follows with three, and Connecticut, California, Florida, Indiana, Minnesota, New Jersey, North Dakota, Wisconsin and Texas have one player each … The U.S. enters the tournament having captured a record 15 consecutive medals, including gold medals in seven of the last ten years (2009, 2010, 2011, 2012, 2014, 2015, 2017) ... 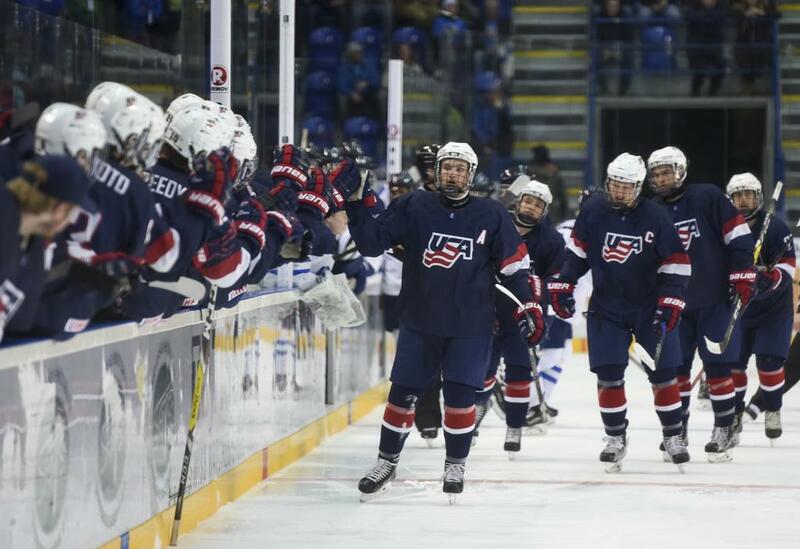 Team USA has won 10 gold medals all-time, the most of any country in IIHF Under-18 Men's World Championship history. The event began in 1999. Team USA earned its first gold medal in 2002 ... Follow @USAHockey on Twitter for live scoring updates during the tournament. Scores will be designated with the #U18Worlds tag ... For additional coverage, visit the USA Hockey Facebook page and Instagram account.) ... USA Hockey's international council, chaired by Gavin Regan (Potsdam, N.Y.), has oversight responsibilities for all U.S. national teams.